Or more aptly titled – what I made during my summer time off… I found these fabulous glass chili pepper beads at a bead show a couple of years ago and scooped them right up. 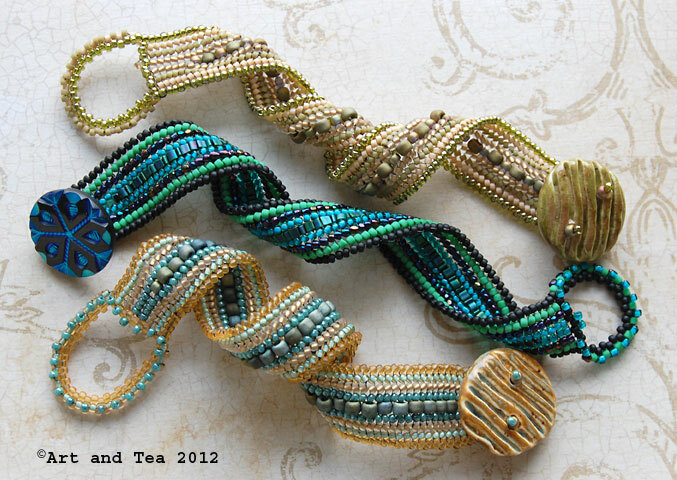 Combined with some copper wirework and teal beaded rings, they’re very swingy. These earrings were created during a fun color mixing session with polymer clay. The discs were made from a sheet using the Stroppel cane, Alice Stroppel’s wonderful technique using cane scraps. The oblong cane slices remind me of pills from a Mario Bros. video game my kids used to play when they were young. Very colorful! Marbled drops created during another polymer clay playtime session. The agate rounds I found at Munro’s in Michigan last spring and complement the drops very nicely, I think. More polyclay drops, these ones I created from extrusions. The bead caps were made with my new disc cutter and a tiny spiral stamp. A bit wonky looking but ok with the primitive tribal feel. The copper washers were textured from a brass plate. These earring components were created from a polymer clay sheet that was painted with alcohol ink, sprinkled with mica powder and then run through my pasta machine when everything dried. They remind me of raku pottery. 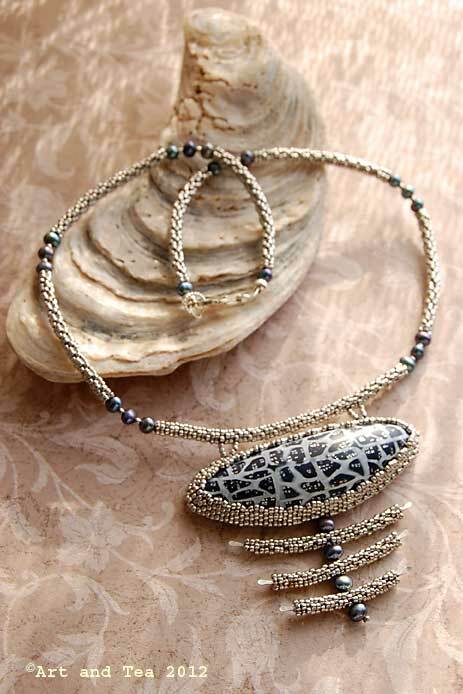 A glass blossom dangles from a delicate sterling chain. These polyclay components were created using Randee Ketzel’s Snowflake Jade cane tutorial. I just love the depth achieved from layering with translucent clay. Swarovski crystal raindrops dangle from the delicate sterling chain. More Snowflake Jade components paired with Swarovski opaque white crystal beads and sterling silver wire. These earrings were created to go with my “Spacetime” necklace I have yet to introduce to you. I recently purchased some of Christi Friesen’s Swellegant metal patinas and colorants and started my experimentation with some 16-gauge copper wire spirals. The next 4 earring pairs were created with those spiral dangles. I think the blue-green patina looks so yummy on the copper! 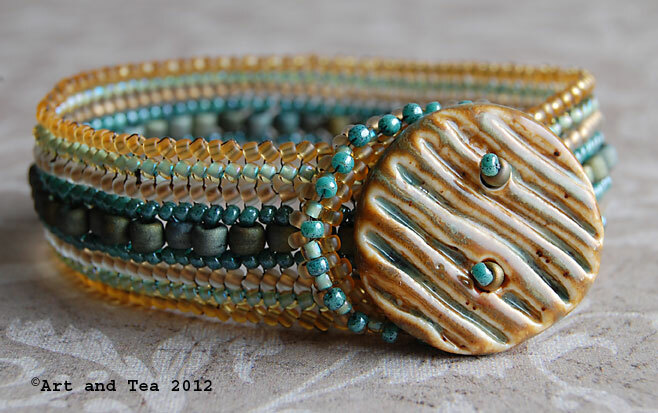 Here we have African opal and turquoise heishi. 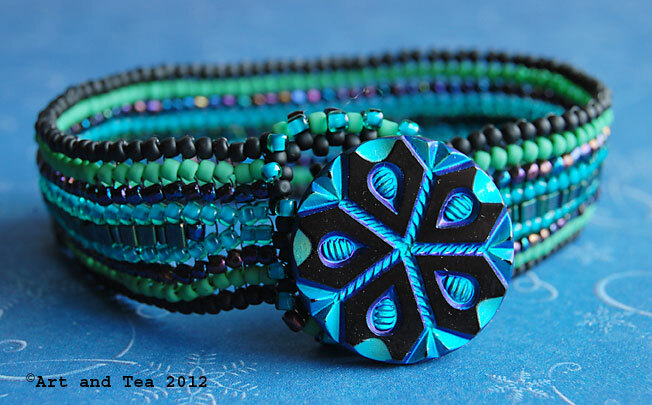 Some Czech glass beads and turquoise heishi. 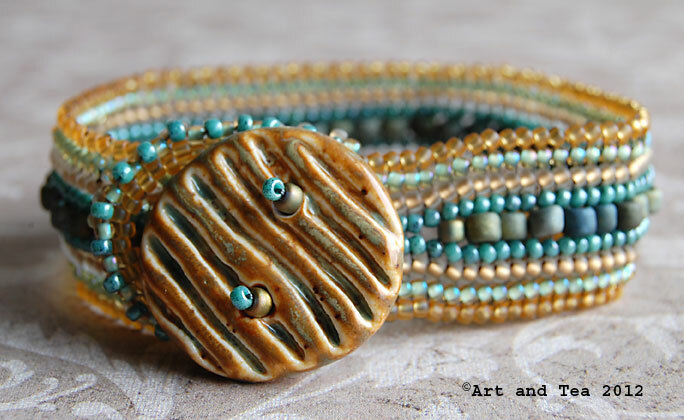 Some gorgeous enameled copper spiral shell beads by Maryann Carroll along with turquoise heishi. A couple of years ago, I was experimenting with translucent polymer clay and silver leaf to create a button for my Winter Woods Vest. 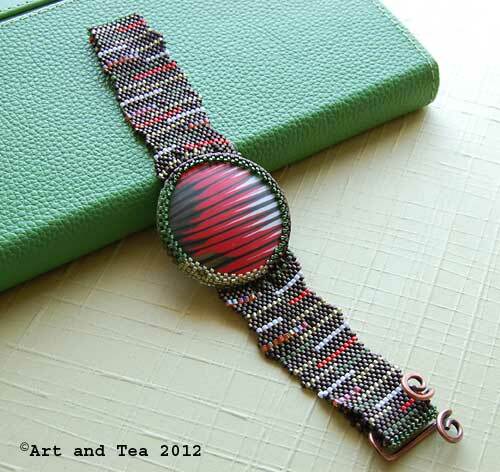 Besides the button, I also created a cabochon and a long, thin focal bead from that design sheet. Using a dab of E-6000 glue, I affixed the cab to some Lacy’s Stiff Stuff backing and it sat there on my work table for a year as various designs percolated in my mind. That’s the way I like to work. 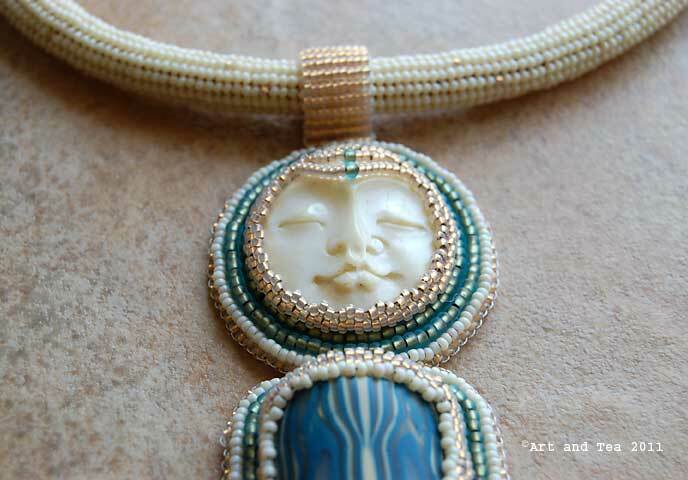 I create a component that I’d like to bead and/or use in a jewelry design and then I just let it sit there in my studio where I can gaze on it periodically. The component image imprints on my brain and in my imagination and, as I go through my day-to-day experiences, it changes shape and grows. My first inclination was to orient the cab as a vertical pendant. 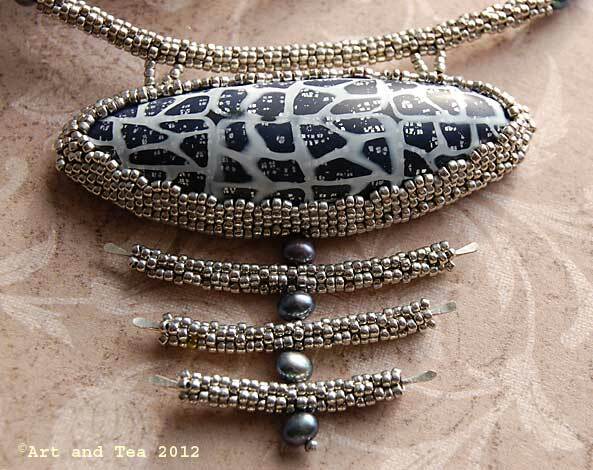 I knew that I wanted to use silver beads and grey pearls and played around with several designs but nothing felt quite right to me. At this point, I had added the silver beading around the cab. 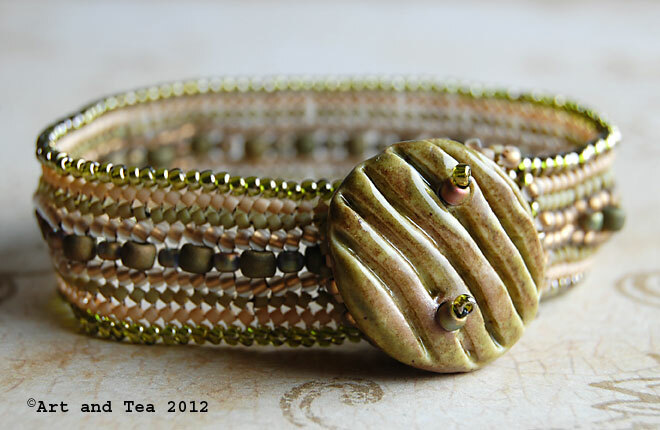 I liked the way the sparkly silver seed beads set off the silver leaf peeking out from under the translucent clay. Around that time period, I was driving into Boston a lot and images of reflections on the city streets, wet from newly fallen snow, joined the beaded cab image in my mind. One day my intuition told me to turn the cab to a horizontal orientation and, at that moment, something clicked inside of me and the design started to fall into place as I peyote stitched the silver tubes. I think that the clean lines of the long thin tubes contribute a quiet, reflective, zen feeling to the piece. Underneath that hushed quiet glows the heart of the city. 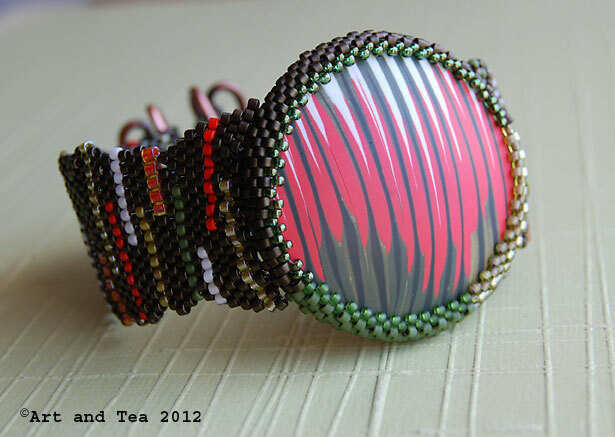 Now that this piece is finished, my thoughts turn to the long, thin focal bead for another piece. I think I just might go with the same horizontal orientation. What do you think? A little over a year ago, I was excited and honored to attend a weekend workshop with Julie, one of my polymer clay/color heroes. The first word that comes to my mind whenever I look at her work is…..yummy. 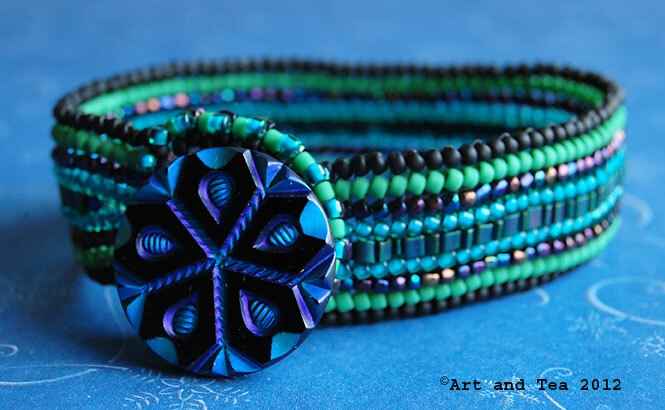 Her use of color, design and texture all flow together in such an amazingly vibrant way. As part of her workshop, we made these nifty little polyclay pieces that Julie calls “lizard tails”. As much as I love Julie’s work, I didn’t want to duplicate her jewelry pieces but put my own artistic voice into my piece. 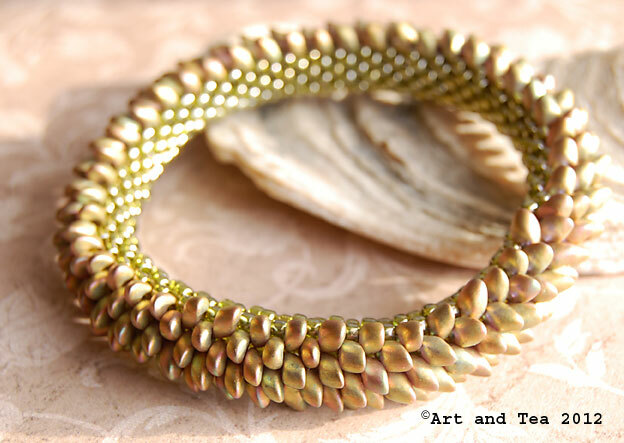 So, being true to my style, my “lizard tail” became the body of a bead embroidered Goddess. Many moons ago before I started creating jewelry and beadwork, I loved to embroider. I remember my Hungarian grandmother teaching me how to carefully lay stitches down on a tablecloth when I was very young even before I started going to school. I continued embroidering on into my teen years, creating colorful designs on t-shirts, denim shirts and pairs of denim jeans so ripped up that I transformed them into purses. 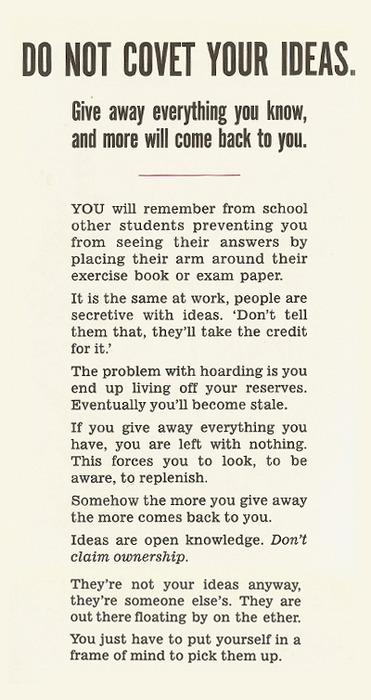 Ah, happy memories! 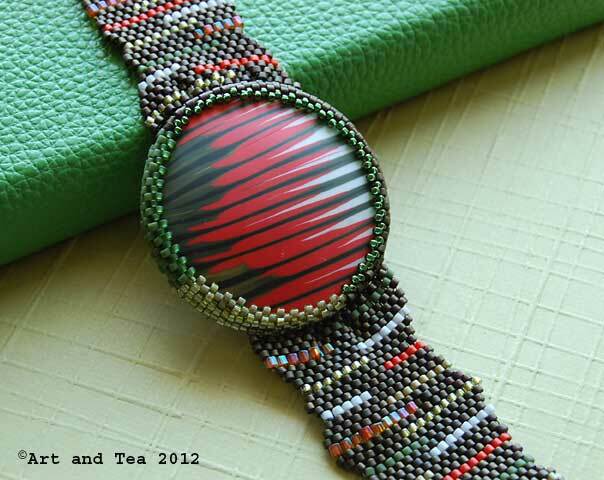 I loved taking an everyday object and embellish it with colorful stitches. 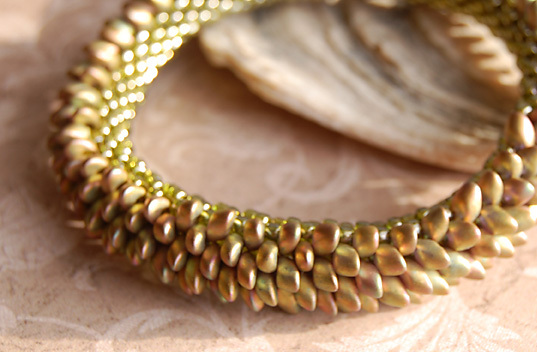 Years later when I discovered that I could sew with my beloved beads, well, oh my, I was in heaven. 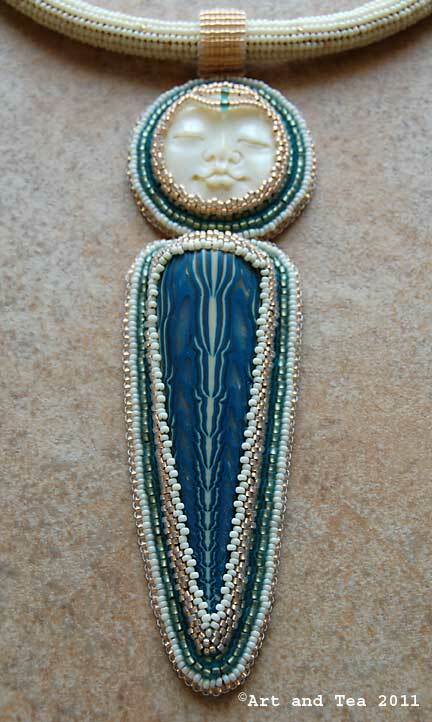 This beautifully serene, bone face cabochon was purchased years ago at a bead show in Providence and has sat patiently in my studio stash waiting to be included in its own unique piece of jewelry. 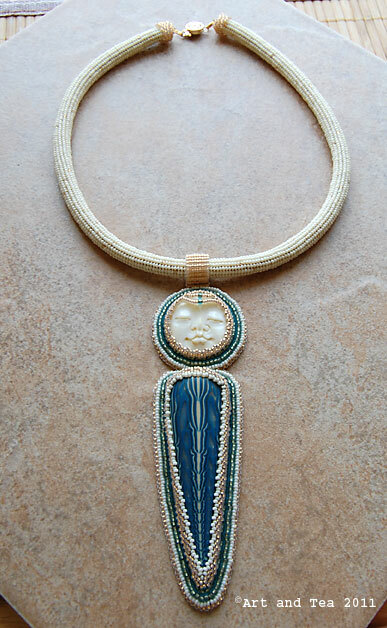 I beaded the face and body separately on Lacy’s Stiff Stuff and then sewed them together before adding a final beaded edge to the whole pendant. I thought about adding some fringe or a bead drop but decided finally to just keep this piece as simple as possible with no embellishment. 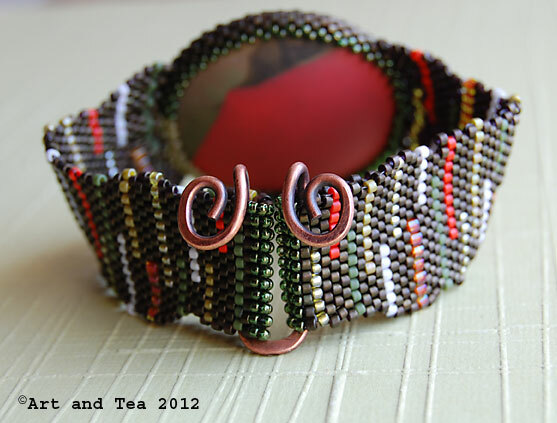 The choker is beaded in my favorite beading weave, herringbone stitch, with tiny size 15 beads. 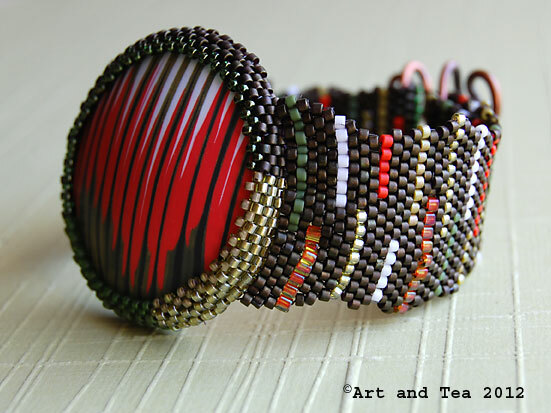 In seed beads as with wire gauge, the larger the number, the smaller the bead (or wire). 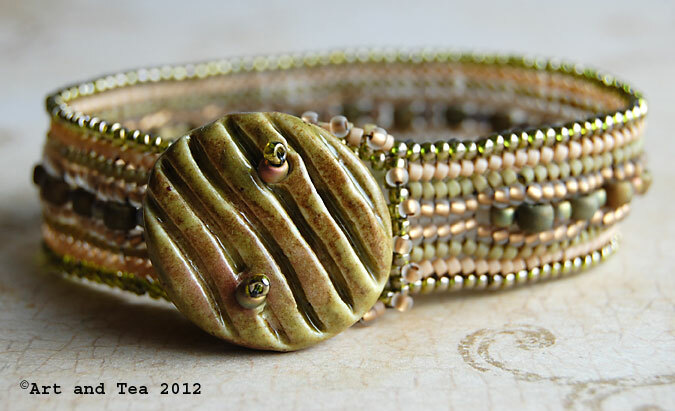 I then beaded small gold caps to finish the choker ends and added a gold-filled filigree box clasp. 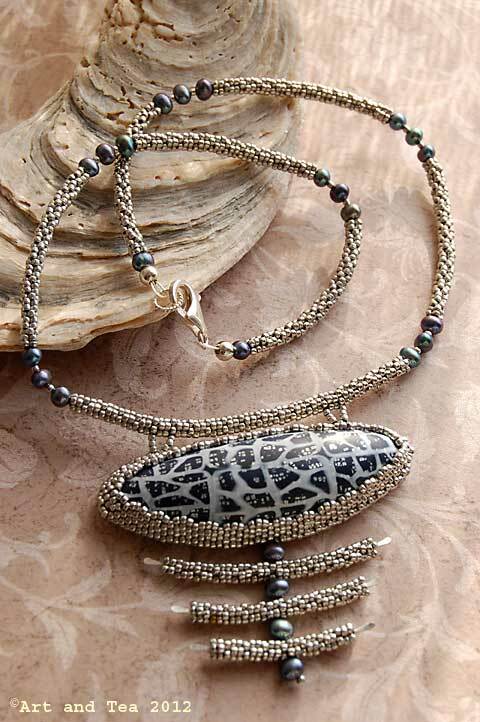 Despite its long pendant, this necklace is so lightweight and such a pleasure to wear. It is backed with soft Ultrasuede. 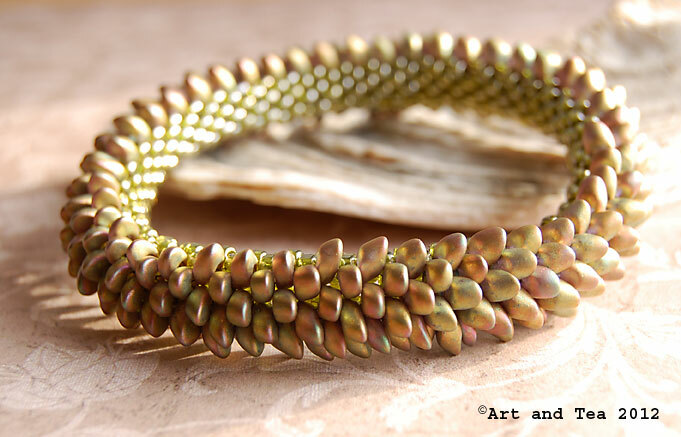 I thought it wonderfully synchronistic that I finished this piece the same week that I received my copy of Julie’s new book, “Patterns in Polymer: Imprint and Accent Bead Techniques“. If you’ve never had the opportunity to take a workshop with Julie, this is the next best thing and is filled with eye candy inspiration and instruction on creating your own unique mokume gane pieces.